On Saturday, my husband and I went to Home Depot to pick up some topsoil to level an area in our back yard. Of course, I had to wander into the houseplant section. And of course, I couldn't resist the impulse to buy new plants. 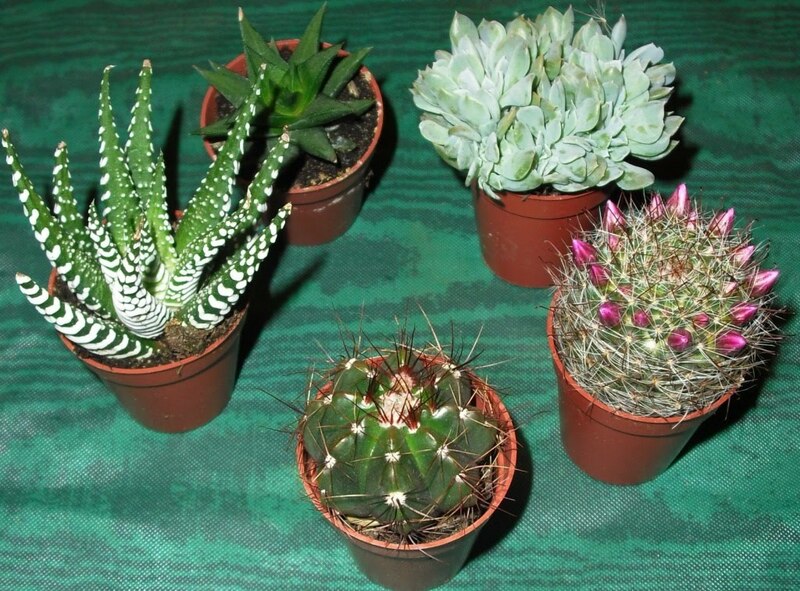 So for the fourth time this month, I found myself purchasing small pots of cacti and succulents. 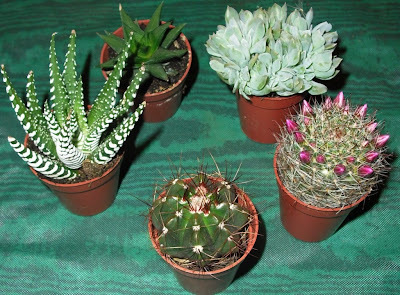 Clockwise from the top left: Haworthia NoId, crested Echeveria (perhaps E. runyonii) NoId Mammillaria, some cactus or other that is not a Mammillaria, and a Haworthia attenuata variety. These are in 1.5 inch pots. 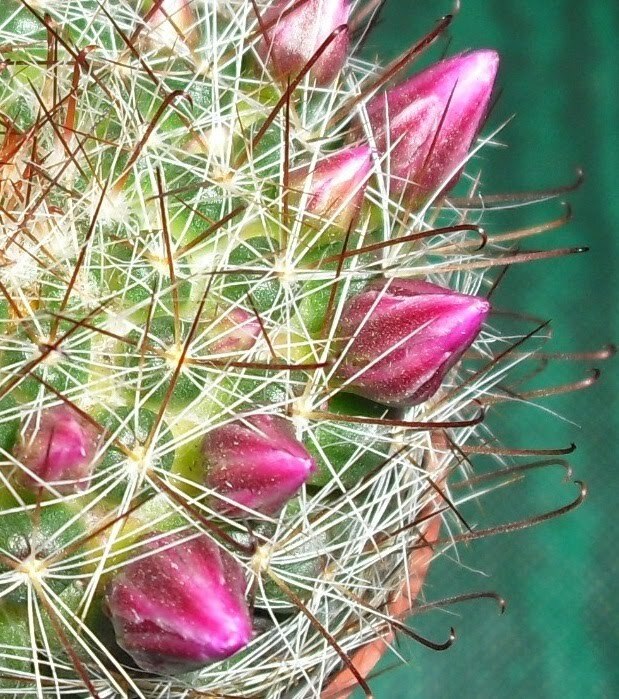 I was drawn to the Mammillaria largely because it was the only plant with real flower buds in a sea of glu-fers (Garden Web C&S forum slang for cacti with glued-on strawflowers, a heinous marketing ploy among certain suppliers.) This Mammillaria returned my admiration and became quite attached to me. Literally. This thing has really horrible hooked spines that stuck in my skin while I was setting up this photograph, and refused to let go. The whole plant was dangling from my fingertips, and hurt like hell. I had to call my husband for assistance. Up close and personal with the hooked spines. The other NoId cactus. I think those might be beginnings of flower buds at the crown, which I why I bought this one. 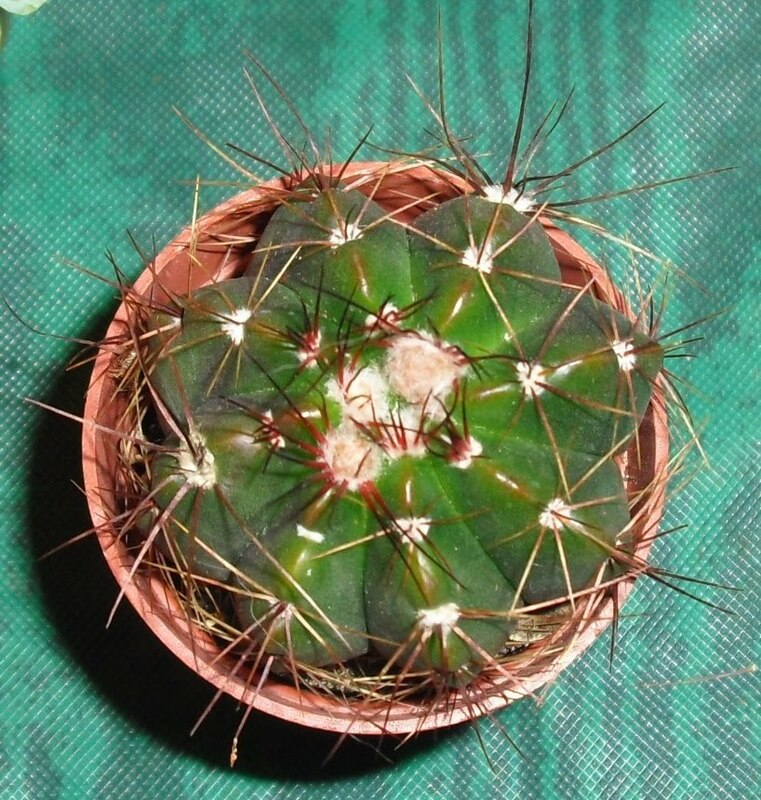 Not to be outdone, Bob picked up the non-Mammillaria cactus and found himself with a spine embedded in his finger. And to think, I don't buy Opuntiads because I'm afraid that the animals might hurt themselves. If tonight was any indication, I think the biggest danger would be to the Homo sapiens in the household. Succulents are very habit forming. 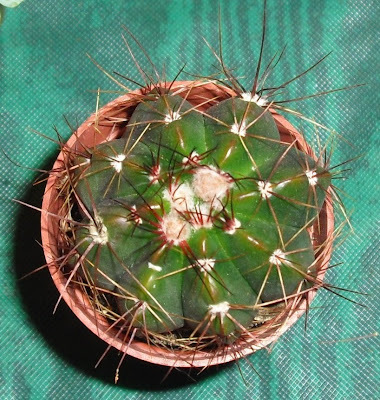 I keep looking at pictures and saying "I want this one and this one and....."
Your no-id cacus is a Ferocactus, probably fordii. In another life, before the upheaval of divorce and a new job 3500 miles away, I had a rather large cactus collection, with quite a few Ferocacti. Loved them dearly, but they were painful to repot! Had to give them up; they were donated to the Birmingham Botanical Gardens, Arid greenhouse. I've visited them a few times since. So pleasant seeing my old friends on your blog. Bless you for that pleasure!